After having acquired ro-ro vessel AKRITAS, Salamis Lines have announced the start of a new weekly service. The vessel will serve the ports of Thessaloniki , Limassol and Haifa as from Friday 12 April. On 8 April, the Flensburger-Schiffbau-Gesellschaft’s seventh ro-ro ship for SIEM was successfully launched. Her name, LEEVSTEN, comes from the Lower German dialect and means “Dearest”. The Onorato Group charters the two previous SIEM units ALF POLLACK and MARIA GRAZIA ONORATO. Local newspaper Kieler Nachrichte reports that the LEEVSTEN goes to “a Mediterranean company”. She will be delivered during summer. Turnover: SEK 908 million (SEK 839 million). CMP handled 15.1 million tonnes of freight compared with 15.5 million tonnes in 2017. Decrease in volumes in the oil sector. Success story mainly due to cruise business. Increase in ro-ro volumes: 298,000 handled units. 22% of Baleària passengers = foreign market. On these international lines, passenger growth was 26% while sales exceeded 84 million euros (16% more). Half of the group’s passengers (2,277,000) travelled the lines connecting the Iberian Peninsula to northern Africa (Morocco, Algeria, Ceuta and Melilla); thus, northern Africa is the area where the company is growing the most. 50% of business is cargo, with a growth of 3.3% (5,800,000 lane metres of goods carried). Reasons for drop in EBITDA and net profit are the high cost of the implementation of the new routes on the Alboran Sea and around the Canary Islands, along with the increased bunker price. Trend expected to remain steady this financial year while new traffic routes are consolidated and the planned ship engine refittings are completed as they are currently inactive. PPA S.A. will pay € 4,8 million concession fees to the Greek State for the year 2018 compared to € 4,1 million in 2017. Havila Kystruten AS and Kongsberg have signed a 10-year “Power-by-the-Hour” service agreement for four new coastal cruise vessels that are currently under construction in Spain and Turkey. The contract value is 150 MNOK. Power-by-the-Hour was launched in 2017, and was first sold to the cargo operator NorLines. The agreement means that the vessel owners is handing the responsibility for service planning and performance back to the equipment’s supplier, Kongsberg Maritime. The customer pays a fixed charge per hour of operation, per ship. Kongsberg Maritime monitors the equipment aboard each vessel from on shore, collecting data from onboard sensors. Kongsberg’s engineers will be able to connect to the ship and carry out service activities remotely or, if necessary, send out a service engineer to do the job. 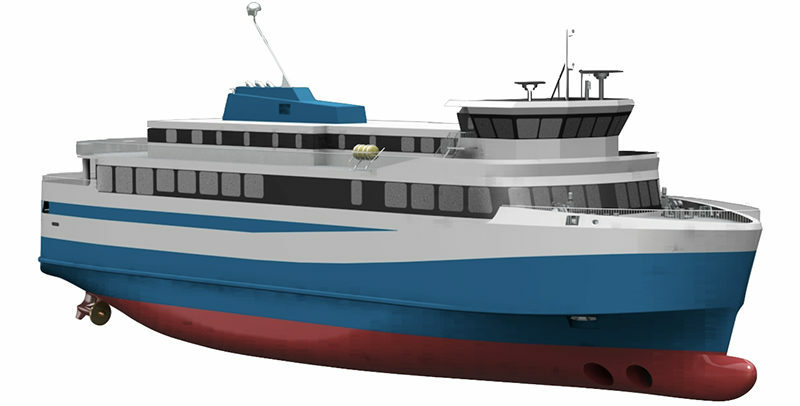 From January 2021, Havila Kystruten will operate four passenger ships on the coastal route between Bergen and Kirkenes. The ships will be equipped with a large equipment package from Kongsberg Maritime, including main propulsion thrusters of type Azipull with Permanent Magnet (PM) drive motor, PM tunnel thrusters, and stabilisers. Kongsberg also delivers the ships LNG systems, which include four Rolls-Royce Bergen gas engines. Ballard Power Systems Europe A/S is establishing a Marine Center of Excellence dedicated to fuel cell marine applications at the Company’s engineering, manufacturing and service facility in Hobro, Denmark. The Marine CoE will design and manufacture heavy duty fuel cell modules to address zero-emission powertrain requirements for the marine industry. Iceland’s Minister of Transport said the country would not pay an extra billion Icelandic kronor (€ 7.5 million) for the HERJOLFUR. This ferry is built by Crist S.A. in Gdynia, for the connection with the island of Vestmannaeyjar. The minister says the yard has sent an extra, unexpected invoice at a very late stage. The issue has to do with the fact that during the building process Iceland required the hybrid design to be changed into full electric. The issue will be brought to Court. The hope is nevertheless to have the ferry delivered. Last year, Corsica Linea transported 1.2 million lane metres of freight. This growth means a shortage of space in the port of Marseille. Works are being undertaken to increase the terminal capacity, and to make the link between ship and shore more efficient for the movement of unaccompanied ro-ro freight. Parking space will go up from 202 lorries to 272.